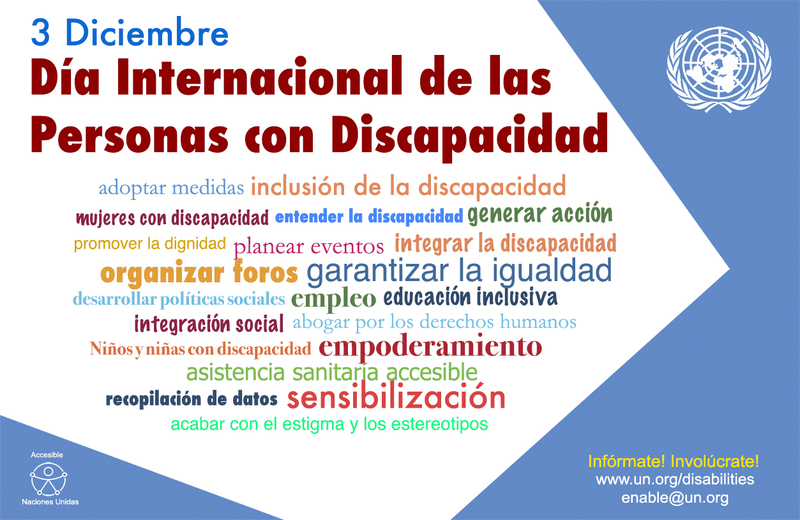 Since 1992, the United Nations International Day of Persons with Disabilities (IDPD) has been celebrated annually on 3 December around the world. The theme for this year’s International Day is “Achieving 17 Goals for the Future We Want”. This theme notes the recent adoption of the 17 Sustainable Development Goals (SDGs) and the role of these goals in building a more inclusive and equitable world for persons with disabilities. This year’s objectives include assessing the current status of the Convention on the Rights of Persons with Disabilities (CRPD) and SDGs and laying the foundation for a future of greater inclusion for persons with disabilities. 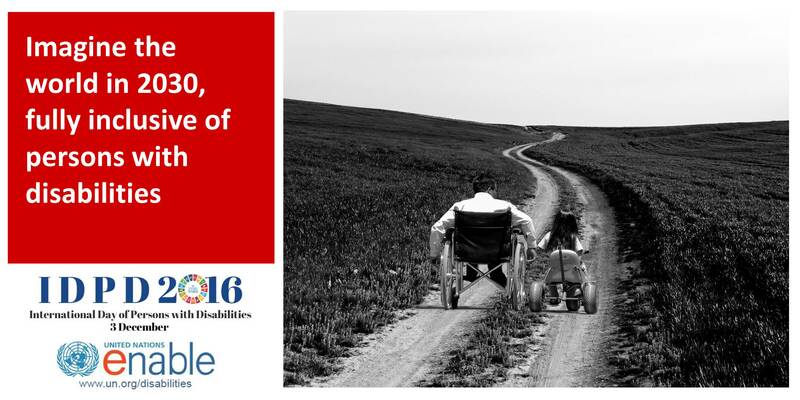 Observance of the 2016 IDPD coincides with the 10-year anniversary of the adoption of the CRPD – one of the most quickly and widely ratified international treaties put forth by the United Nations to date. 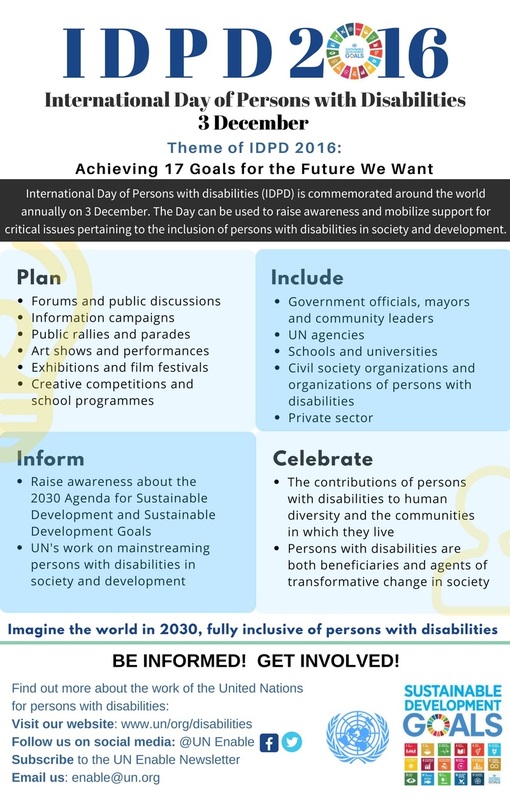 Events for the 2016 IDPD celebration at UN Headquarters in New York City will be organised by the Department of Economic and Social Affairs (DESA) in collaboration with Member States, the UN system, academic institutions, civil society, disabled persons organizations, and the private sector. The Opening of the International Day will include the Day’s message from the UN Secretary-General, as well as statements from Member States and other stakeholders. The President of the General Assembly, in accordance with General Assembly resolution 70/145, will organize a panel discussion to commemorate the 10-year anniversary of the adoption of the CRPD and its universalization. Mayors of cities from around the world will share their advances and plans for inclusive, accessible and sustainable cities for all, with special attention to persons with disabilities. The event will build on the growing momentum towards universal inclusion and accessibility, emanating from implementation of the Sustainable Development Goals and the recent adoption of the New Urban Agenda at the Habitat III Conference in Quito. Organized by DSPD/DESA and NYC Mayor’s Office for People with Disabilities (MOPD) in partnership with Permanent Missions, this event will bring together city leaders, celebrities, practitioners and decision makers to celebrate their successes in reducing inequalities and promoting inclusive development through improving accessibility in cities. 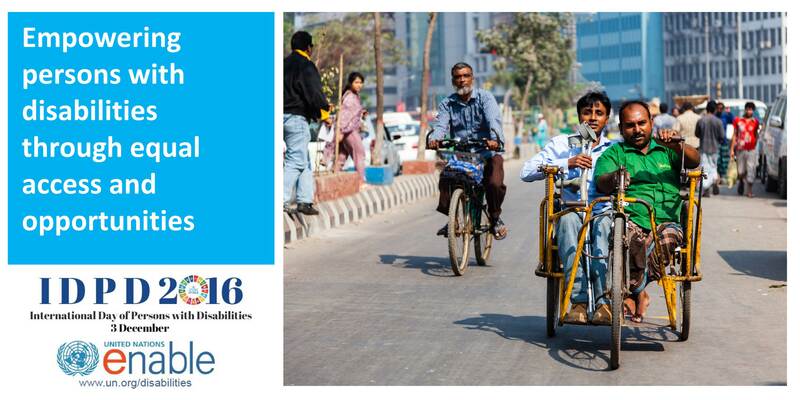 The event will honour and raise awareness of the importance of inclusive, accessible and sustainable cities. The event is a call to action for leaders at all levels, and in all sectors of society, to make universal accessibility a priority and a reality. Organised by Institute on Disability and Public Policy, American University. This event will celebrate the soft launch of a beta version of an iOS 10 mobile application on the UN Convention on the Rights of Persons with Disabilities (CRPD) to commemorate the 10th anniversary of the CRPD. This will be the first mobile app of its kind, with the aim to raise awareness of this critical disability policy framework, its contents, and its significance for human rights and disability rights. The beta version of the mobile app will facilitate greater broad public understanding of the CRPD and feature a listing of the articles of the CRPD, as well as indices of countries that have signed and ratified the Convention with corresponding dates. This event will present the main challenges persons with disabilities face in the Africa region, such as exclusion, discrimination and challenges to the enjoyment of their fundamental rights and inclusion in development. 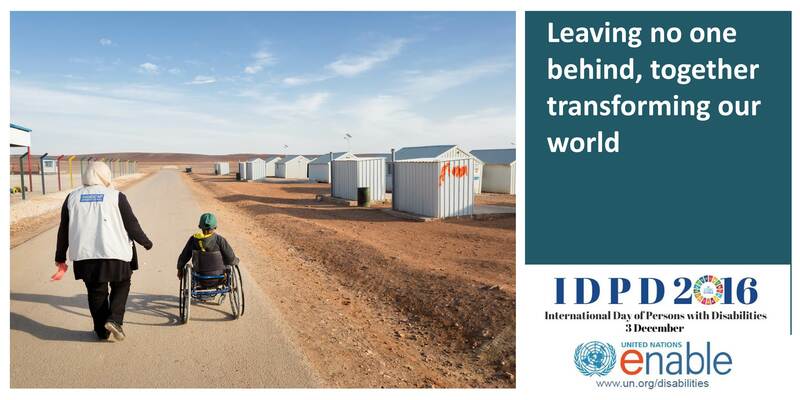 UNDESA has developed a Toolkit on Disability for Africa to build the capacity of Government officials and DPOs in the region, with a view to implement solutions in line with the CRPD. This session will review ten years of progress in implementing the Convention on the Rights of Persons with Disabilities (CRPD) to achieve inclusive, accessible and sustainable society and development. Experts from the United Nations, civil society, academia and industry will share their perspectives on the progress of disability rights, policies and programs promoted by the CRPD and discuss solutions to foster their implementation by States Parties, in particular as they relate to the accessibility of Information and Communication Technologies. The session will conclude with a discussion of priorities which CRPD States Parties and stakeholders may pursue for the next ten years. Heidi Latsky Dance will stage a movement installation of 20-30 performers who together form a living gallery. The installation features different and unexpected bodies in white clothing (signifying all the colours of the rainbow and a metaphor for inclusion) moving as reverent sculptures in the space. The installation is sponsored by New York City”s Mayor”s Office for People with Disabilities (MOPD). Similar installations will take place simultaneously around the world that will be showcased at UN Headquarters. http://heidilatskydance.com. 9.30 to 10 a.m., UN Visitors’ Lobby. 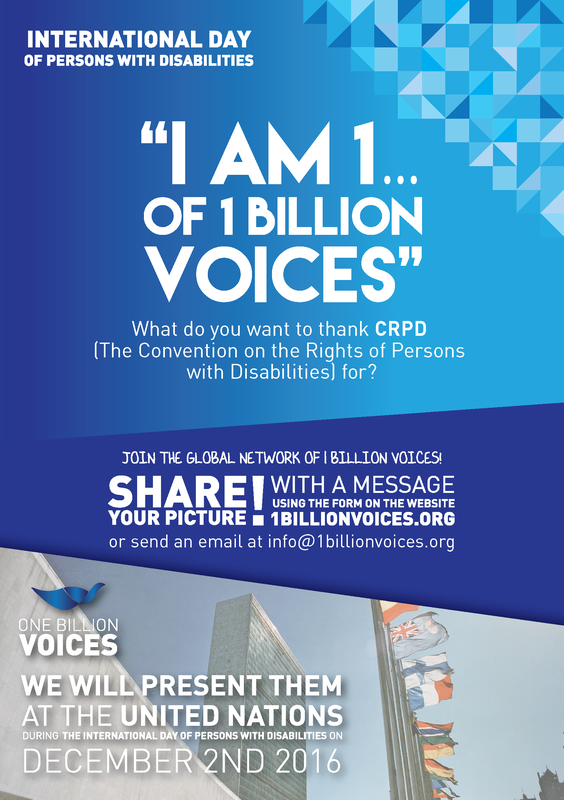 What do you want to thank the CRPD for? Share your picture with a message. The United Nations Enable Film Festival (UNEFF) includes short disabilty-related films selected on the basis of their content and message that can help raise awareness of disability issues and further promote the full and effective participation of persons with disabilities in society. The UN Enable Photograph Exhibition works towards the full integration of persons with disabilities in every aspect of the lives of their communities – political, social, economic and cultural, and on an equal basis with others. The photographs selected aim to raise awareness about disability issues and mobilize support for the dignity, rights and well-being of persons with disabilities. In light of the 10th anniversary of the adoption of the Convention, this year the UNEPE will highlight the positive ways in which the Convention has impacted the lives of people around the world. Final list of photographs selected for UNEPE 2016! The MEDD is an informal Network experts, researchers and practitioners from the UN system, academic institutions, member states, non-governmental organizations, particularly disabled persons’ organizations, and development partners with experience and expertise in the areas of monitoring and evaluation of the implementation of the international development goals, including expertise in policy-analysis, data, statistics, monitoring and evaluation relevant for disability-inclusive development, particularly in the context of the 2030 Agenda for Sustainable Development. 28-29 November 2016., 10.00 a.m. to 5.30 p.m. Invitation only. The Working Group on Disability and Digital Societies explores how digital information can empower persons with disabilities and contribute to disability-inclusive development, in particular the monitoring, evaluation and implementation of the 2030 Agenda for Sustainable Development. 30 Nov 2016, 10.00 a.m., to 12.30 p.m. Invitation only. This talk with present existing disability-inclusive legal and policy frameworks as well as key-interventions to promote inclusion in Uganda, and discuss how these instruments can contribute to the achievement of the Sustainable Development Goals. Challenges in mainstreaming disability will also be discussed. 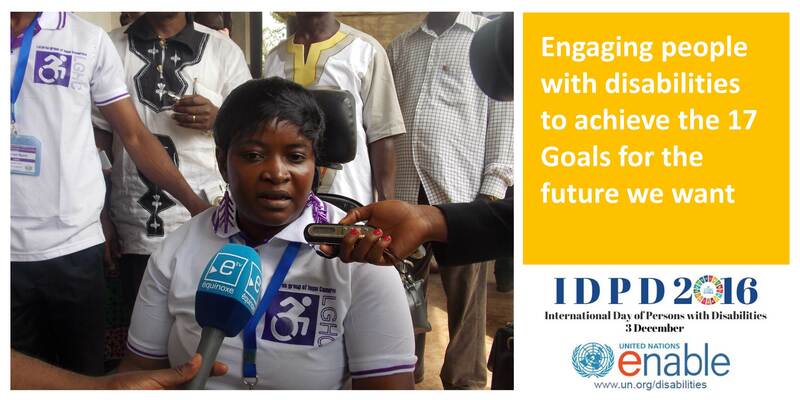 Include: Observance of the Day provides opportunities for collaborative and inclusive events by all stakeholders – Governments, the UN system, civil society and organizations of persons with disabilities – to focus on issues related to the inclusion of persons with disabilities in society and development, both as beneficiaries and agents of change. 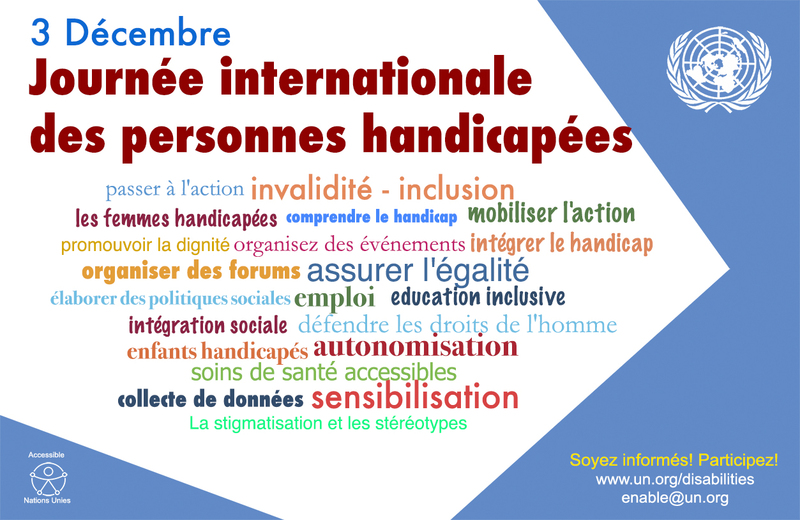 Organize: Hold forums, public discussions and information campaigns in support of the themes of IDPD 2015 to discuss and share ways of including and empowering persons of all abilities to develop and be fully included in their local communities. 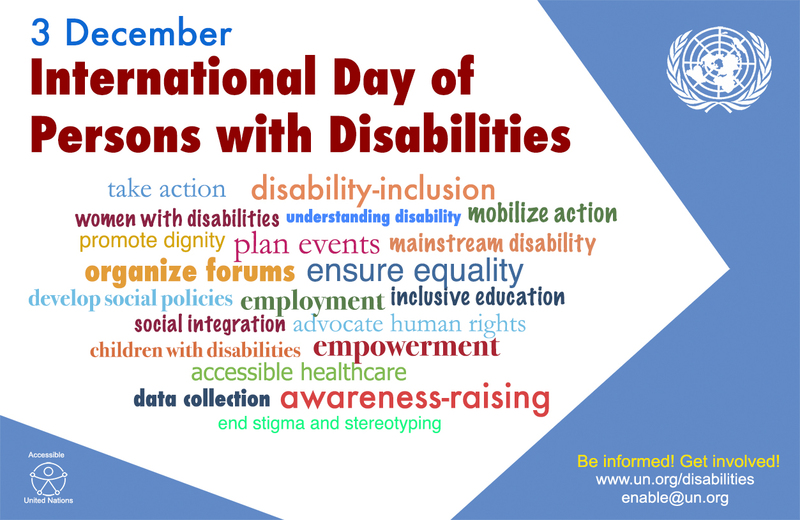 Celebrate: Plan and organize performances everywhere to celebrate the contributions made by persons with disabilities as agents of change in the communities in which they live. Celebrate persons with disabilities by creating opportunities to help realize their potential, be it through music, sport, academia or interpersonal skills. Take Action: A major focus of the Day is practical action to realize the objectives of the Day for persons with disabilities and their communities. So, highlight best practices and think about making recommendations to your local political leaders, businesses, academic institutions, cultural centers and others. Work to ensure that your activity leaves a legacy and brings about lasting change.